Turned out pretty good didn't it? The pastry was buttery with a nice bite to it, the sponge was light with a delicate almond flavour, the flaked almonds browned nicely giving the top a lovely crunch. I used my home-made strawberry and apple jam in the middle, it added a delightful sweetness and the occasional lump of strawberry was a lovely little surprise. Overall I was really impressed. It was so simple and tasted fantastic. I want to play with the flavour combination some more though, maybe try a traditional bakewell tart, or Holly's bakewell cupcakes from GBBO. 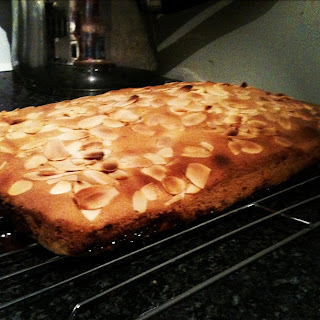 This will not be the last you see of bakewell on this blog, that's for sure. I haven't posted the recipe as I stuck to Mary Berry's original recipe this time, and it can be found online here. When I start playing with it and creating my own versions I will post the full recipe. What have you been baking this week? I am always on the look out for inspiration and ideas for my next bake. I even added a "to-bake list" to this blog to keep track of everything I want to try. P.s there have been twitter rumours that the lovely Mary-Anne from GBBO might be judging this weeks challenge and crowning a star-baker, wish my little tray bake luck! And lookie what I got! Great bit huge thanks to The Weekly Bake Off and the lovely Mary-Anne from The Great British Bake Off for judging and awarding me joint star-baker. looks delicious!! Such a shame i'm dieting other wise I would polish it off very quickly! lol Maybe you could add some not too sinful baking to your 'to bake' list??? Give me a WW recipe and I will try it for you! Looks yummy, I love anything bakewell related! I tried Mary Berry's date and walnut traybake from the Baking Bible a while ago which was lovely. Think I need to try more of her traybake recipes. Good luck, these look really good. Amazingly I've never made a Bakewell tart either.